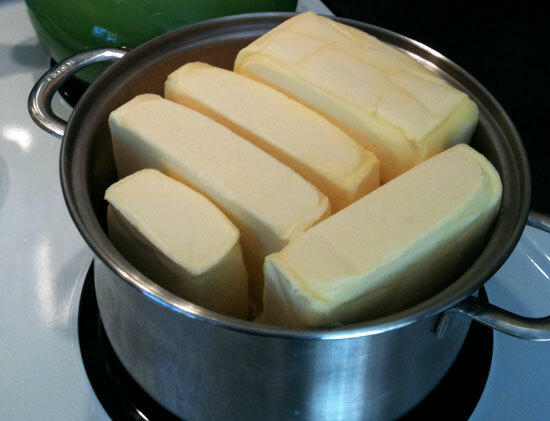 One thing you forgot to mention: when you clarify your butter, it makes your house smell amazing. Adam, you are totally right. Sometimes, food can be a multi-sensorial experience. At our Foundations of Nutrition workshop in NJ this weekend, we were talking about coconut butter and how you could simply eat it with a spoon (and forgo putting it on anything), and a guy in the crowd said, “Oh, yeah, totally… I just put it on… my wife.” Umm, I suppose that works. Good for you, dude. The link provides additional evidence on problems with milk/dairy products. They have bulk purchasing available, if you know enough Whole9-ers in your area to split a case! Why “No butter of any sort during your Whole30” if clarified, happy-cow butter is a good food choice? Why exclude good food during the Whole30? That seems inconsistent with the overall program. Another great article telling both sides of the story with recommendations. I am guilty of indulging in butter but I definitely will be looking for the pastured stuff and clarifying it. Thanks for the info. @Tom: Valid question. The clarification process is manual – you have to strain out the milk solids by hand. This means that not ALL of the milk solids are removed from the end product. For most people, the tiny amount of milk solids shouldn’t pose a digestive issue, but during your Whole30, you have to eliminate ANY and ALL inflammatory components from your diet. Even a tiny bit of milk solids can aggravate inflammation in the gut. So all dairy is excluded for your 30 day period. PS Recipes are looking good – I’m digging your curried shrimp with cabbage and carrot salad! @Trevor: Hmmm… I thought our summary paragraph was pretty clear! We’re FOR butter IF it’s organic, pastured and clarified. As for the photo, that was OUR picture, taken in our kitchen, after clarifying two pounds of butter. Princeton may say there are only 2% milk solids in a stick, but when we clarified and separated our butter, we came up with a WHOLE lot more. In our opinion, even small amounts of milk solids are problematic. As an anecdotal aside, we splurged a while ago on a bowl of hot, buttered (organic) popcorn while watching a movie at home. We used pastured, organic butter, but didn’t clarify it first. After the bowl, my stomach was in knots – the typical “dairy” feeling I get after eating cheese or yogurt. Last week, we made another batch, using the same popcorn, but this time using clarified butter. No stomach issues at all. Sure, it’s only an experiment of one, but again, I’m more likely to believe my body than Wikipedia. ” I’m more likely to believe my body than Wikipedia” – Melissa I will agree with you there. And I also agree that butter is not so bad. I was on the fence about butter for the longest time but after having read Good Calories Bad Calories I think that it is the lesser of the two evils when choosing between margarine and butter. I will have to try the clarification method as well, but don’t know if it is worth the time for me because the milk solids in the butter don’t really bother me even though I am lactose intolerant. And since we are on the topic of butter here is a great recipe for thanksgiving. It is totally up to you whether you take the time to remove the milk proteins from your butter, though we think eliminating inflammatory proteins from our diets is always worth it. Worth mentioning, though, is that your lactose intolerance, of course, wouldn’t be affected by the milk solids, because they’re not lactose – they’re proteins. And to clarify, we are not endorsing the recipe you linked to that uses 1 stick of butter for 4 potatoes (whoa!). We will be posting some suggested Whole30-approved Thanksgiving recipes in the coming days, but unfortunately, we can’t support your recipe suggestion. Thanks for your thoughts. Maybe it’s just me but the longer I eat clean, healthy food the less I want or crave unhealthy stuff. I ditched butter when I went Paleo in August of ’09 and haven’t looked back or missed it since. The only dairy that still shows up in my diet is heavy cream in my weekend coffee since Robb Wolf has said it was OK on his podcast. Though, I’m curious what Melissa and Dallas have to say about that particular point. I think it’s the fat profile that makes it ‘better’ than milk but I’m guessing you would probably caveat it the same way you did butter. The occasional splash of cream in my coffee is just a component of my F-off list, along with my occasional glass of wine, scotch, or beer. Something to be enjoyed from time to time. Although the amount of dark chocolate I consume could probably be reduced a bit! Speaking of F-off list, I swear I’m going to start a petition soon. If I could vote for my #1 most wanted future Whole9 post it would be Healthy/F-off Scale 2.0. Seriously you guys, give me that post for Christmas this year and you can have my first born! I agree with Lydia that http://www.pureindianfoods.com/ has some great tasting grass fed glee. I buy 6 large jars at a time and store the unused jars in the refrigerator. Each jar last our family of five one month. This butter is amazing. While visiting Melissa and Dallas last week I got to sample some of it. It was so yummy! It was a nice change from the coconut oil I’ve been cooking with for the last year. Like we’ve all said a hundred times “everything taste better with butter” and this stuff did not upset my stomach. It really gives the paleo dishes a warm, fuzzy feeling. Hopefully my farmer will pull through so I can clarify some out here. Wow, how I do love the green organic valley pasture butter! It feels like a candy bar to me, when I bring it home I’m always tempted to unwrap it and take a bite. I think Paleo people have to be cautious not to do what the low fat/ low cholesterol people have done in the past, which is to idealize certain foods, and villainize all foods that don’t fall into their parameters. Things like butter and cheese certainly deserve more tasty research. One question/concern I have about Ghee: I’ve heard that heating butter causes its cholesterol to oxidize? What is a normal and healthy cholesterol, when oxidized, turns into a free radical. Do you have any insight into this delicious dillemma ? Wait… popcorn? Someone please explain before my head explodes! I use ghee often, but I’m also happy to use our raw, pastured butter. I think an area you skipped over, that is essential to address, is whether the butter is raw or pasteurized. I have an autoimmune condition. I can not consume pasteurized dairy, even in the minute amounts present in ghee, but with the raw dairy, I’m absolutely fine. As always, we love what you guys are up to over here. I think it’s hilarious that you’re threatening to start a petition for a H/F-O 2.0. We’re working on it, we promise… but we’ve got a few Thanksgiving themed posts (and lots of recipes!) to hit first. Soon. We promise. Yes, we’ve read both the Healthy Skeptic and the Weston Price articles. We agree that omega-3’s are “precious yet perilous”, and that’s why we hammer folks in our workshops to aggressively change their diet and lifestyle factors if the Robb Wolf fish oil calculator tells them they need to take it by the bottle. Furthermore, we recommend being very “selective” (read: picky) about where you buy your fish oil from. Like we’ve mentioned before, after several conference calls with StrongerFasterHealthier (including their chief scientist) about their fish oil, we decided that they get our “stamp of approval” for quality and purity. But we don’t agree that “the benefits of fish oil have been grossly overstated”, since we and many, many other folks have literally had life-changing experiences with dietary modification (including fish oil). We think that the Healthy Skeptic simply likes to poke holes in everyone else’s story. In summary, we say that fish oil is a short-term “supplement” to help correct a imbalanced omega-6:3 ratio while you make serious modifications to your diet and lifestyle. Best case scenario: PERFECT diet and NO fish oil. We’re just not there yet. We agree that you should not “villainize” specific foods, especially with an incomplete understanding of which components of those foods are beneficial or harmful. This is why we’ve tried to clarify (no pun intended) the complexity of butter, and make our recommendations for “best choice”. Good question on oxidized cholesterol. There’s a lot of conflicting opinions (not facts) on oxidized cholesterol, and there’s a couple points worth making on this: 1) dietary intake of some oxidized cholesterol is not necessarily a terrible, awful thing (compared to large amounts of oxidized PUFAs! ), especially if your intake of vegetables and fruit are high (i.e. you get lots of natural antioxidants in your diet) and your body’s ability to produce endogenous antioxidants has not been compromised, and 2) while the oxidization process starts at a relatively low temperature, rather small amounts of the total cholesterol in eggs (or butter) actually oxidize through the cooking process. At least that’s the conclusion I’ve reached via the stuff I’ve read. If you’ve got other stuff, shoot it over, please. Also, though we said butter is a “good” choice for cooking, coconut oil is still a “best” choice. If you’re concerned about oxidized cholesterol in your diet, make sure you cook all your eggs either by poaching, soft-boiling, or “over easy”, and don’t break the yolk. Remember, there’s a LOT more cholesterol in eggs than in a little butter. Continuation of above comment, if you’re not asleep yet: it seems that the oxidation of polyunsaturated fats, (which are MUCH more fragile than cholesterol) may trigger the oxidation of cholesterol (KUBOW S. Lipid oxidation products in food and atherogenesis. Nut Rev 51: 33-40) and high triglyceride levels increase cholesterol oxidation in the body (KIM SK, NAWAR WW. Oxidative interactions of cholesterol with triacylglycerides. J Am Oil Chem Soc 68: 931-934). One more: even in a (processed, PUFA-rich) Western diet, only about 1% of the total cholesterol intake was oxidized (VAN DE BOVENKAMP P, KOSMEIJER-SCHUIL, TG, KATAN MB. Quantification of oxysterols in Dutch foods: eggs products and mixed diets. Lipids 23: 1079-1085). Food for thought. I might caution you to be careful with phrases like “…the benefits of raw [dairy] are also well known.”: We try to avoid making sweeping overstatements based on our own opinions, and we think that your statement about raw dairy is a (well-intentioned) overstatement. And on Organic Valley’s “heavy-handed treatment” of raw dairy farmers – they just said that they were not going to sell raw dairy. That’s totally their prerogative (to choose what products they sell), and I can’t fault them for choosing to not sell raw dairy. That’s their business decision, after all. Just got back from an Hawaiian vacation where I ate and drank whatever was convenient and sounded good (TOTALLY NOT “paleo” or Whole30). While I had a wonderful time hiking, paddle-surfing and relaxing, not to mention an utterly inspiring visit to Pearl Harbor, my guts were not happy. After two days of clean eating I feel almost normal. I don’t think I did any irreversible damage, but I have to ask myself why I treat my body so bad when I want to look and feel my best? Sure, it might not SOUND healthy, but IS it unhealthy? If it is unhealthy, what are the effects? Why is it unhealthy? Is there any evidence that those hormones are even making their way into the human body in the first place? That is to say, if I eat beef that’s injected with artificial hormones, am I going to test positive for those hormones? Really? So the healthfulness of a food is directly related to the psychological happiness of the animal it came from? This claim has become commonplace as of late, but people need to ask: Where’s the evidence comparing the composition of butter from pasture-fed cows vs. corn-fed cows? If people want to eat pasture-fed cows for personal or ethical reasons, I am all FOR that. However, I do not like a difference in personal values/beliefs to masquerade itself as “science”. Simply because people don’t LIKE how the cows are treated doesn’t mean that the meat is any more harmful to me than pasture-fed. Thanks for your input. We actually don’t think that the raw vs pasteurized issue is as critical with butter as it is with milk or other dairy products, since most of the negative consequences of pasteurizing milk have to do with the effect on the protein constituents of milk, including casein, whey proteins, and protein hormones like IGF-1. But since we don’t recommend eating those milk proteins at all, the “raw issue” seems moot to us with (clarified) butter. As far as your hypothesis that your Eastern European ethnic background plays into what fats you should choose, I’m not sure I can buy that argument. Essentially no genetic adaptation to food has occurred since “your people” moved north – so we think that coconut oil is still your best choice for cooking, not butter or even tallow/lard. Don’t fall prey to the illusion that because your husband has a 6-pack, it’s because you eat lots of lard, tallow, butter, etc. I’ve been lean for essentially my entire adult life, and I ate breakfast cereal by the box in my early 20s. Looks can be VERY deceiving. Be careful not to connect dots that aren’t (necessarily) connected – though we’re thrilled to hear about a happy, healthy family. In the context of a diet that includes adequately varied fat sources, we think that organic, pastured, clarified butter is a good choice. What you are passing off as intellectual skepticism is nothing more than general disagreement. We don’t think we actually have to make the case that healthier cows are “happier”. In case you haven’t read anything else we’ve written, health is our primary focus here, not animal rights or “personal values/beliefs”. A couple points on the health aspects of hormone-treated dairy (as one example): rBGH-treated milk has higher levels of IGF-1, a promoter of cancer cell proliferation, and IGF-1 is resistant to digestion and readily crosses the intestinal lining. So yeah, the drugs your food is given does actually affect you. The good news for us: if you are think that cows treated with synthetic hormones and antibiotics are “just fine” and choose to eat them, it’s your body, not mine. If you don’t like our health recommendations, you are free to make your own choices. Best of luck. I agree, coconut oil is fine for cooking, but why would you suggest that it’s better than pastured tallow and/or lard? I would love to know your rationale for this. Don’t get me wrong, I’m a coconut lover, I just don’t think you can quantify such things with “better than”, they all have their own unique nutrient profile. Yes, I know, in the context of evolution blah, blah, blah… I get it. I think we also need to remember that people weren’t keeling over from heart attacks in only a few centuries past either. There is still wisdom as close as a few hundred years back, not all of it good, but definitely some gems in there like fermentation of food, eating local, seasonal foods, and using all parts of an animal including bones, organs, and fat. Regarding the 6 pack, that was just a loose comment to illustrate that we eat a lot of these healthy fats and we’ve got some pretty healthy peeps around these parts. I have not “fallen prey to the illusion” that these fats are the reason he’s lean. Actually, I would say it’s the fact that we’ve been eating a paleo diet, grain and sugar free, based on the diets of our ancestors for the last ten years that my husband, and my entire family is healthy. As a nutritionist in this field, I know enough not to base anybody’s health on looks. Thanks for the ‘caution’ though. We think coconut oil is your best cooking choice because it’s almost all saturated fat, which I’m sure you already know is more stable than monounsaturated or polyunsaturated fats. Lard, on the other hand, is only about 40% saturated fat, and about 10% (unstable) omega-6’s (which produce free radicals AND skew your omega-6:3 ratio towards the inflammatory side). “Cleaner” sources may vary somewhat, but they’ll always have more PUFAs and MUFAs than coconut, so we prefer coconut oil as our “most stable” cooking oil. We’re not saying that the animal fats are all bad, we just don’t think they’re “best” for cooking. Thanks for sharing your insight and experience. I made a strategic decision to use my limited brain resources to maintain expertise in the areas of stock market trading and theology and to outsource heavy lifting in the area of diet and nutrition to others. My original source of food-world insight starting in about 1990 was the Center for Science in the Public Interest and the Nutrition Action Health Letter. Later I moved on to the UC Berkeley Wellness Letter as my trusted expert regarding nutrition, fitness, and self-care. The Wellness Letter’s 2010 report “Eating for Optimal Health” has been sitting on my desk for the past few weeks, but the Whole9 has become my trusted expert in recent months and reading the Berkeley report is now a reduced priority. 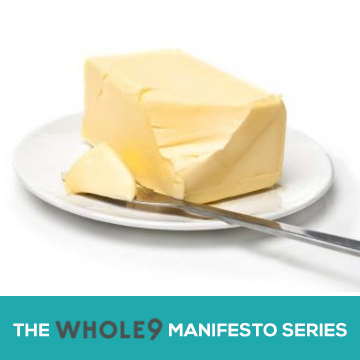 I realized the role the Whole9 has developed in my life while reading through the Butter Manifesto, which I think is a classic example of good judgment informed by scientific research. Finding fault is one of my most highly developed skills; looking for inconsistencies and bias comes as naturally to me as breathing. Twice I thought I caught you in an instance of bias or inconsistency. The first was your advice to limit fruit consumption during the Whole30 and the second was calling clarified butter good food, but banning it from the Whole30. By digging a little deeper, however, I discovered that my grasp of the big picture was inadequate and your judgment well-reasoned. Since you are my trusted experts nowadays, that makes me happy. Thanks. Thanks for your admission and kind words. We constantly revisit our stances on things to re-evaluate and look for inconsistencies, too, so we’re not at all bothered by your (prior) perception of inconsistency or bias. I mean, everyone has biases, right? It would be fooling yourself to think that you didn’t have any bias. We do, too. But we think that a bias that emphasizes health, but that is fully supported by a solid rationale, is an acceptable bias to have… ;) Thanks for all the work you do to consistently put out Whole30-approved recipes! P.S. Maybe we could learn something from your stock market trading expertise! Thanks so much for all the great info you share on this site to help me (and many, many others) along in our Paleo journeys. The butter post started me thinking about fats in general, like Japhy, and about the microwave in specific. I certainly don’t understand all (or maybe even any) of the chemistry, (I majored in classics and philosophy in college–nary a science course in there). So, as previously mentioned, I rely on your considerable expertise. (See sentence one). So my question is–while I am insanely pleased with the convenience factor of the microwave for re-heating leftovers, cooking sweet potatoes in 4 minutes, etc, how does it affect the oils that are on the foods being cooked/re-heated. I regulary toss huge quantities of broccoli in salt, pepper and EVOO, and then zap in the microwave for about 2 minutes. Should I be worrying about this re: oxidization, or is it not a big deal? The fix is fairly easy–zap the brocc then toss it in EVOO, but would like to know anyway. Love the site, love the posts! Thanks again! Thanks Dallas–I just bought the Success Guide, btw. After putting up two comments about how great of a free resource you provide, I realized I could show a little more support than a “thanks”. I hope others take my example. Can’t wait to read the Success Guide! I was lucky enough to find Organic Valley’s pasture butter at my market and…OMG…the taste is AMAZING. Just for that alone, it gets my vote. Soooo I went back and bought all the packs they had left over. Thanks for the tip! Thanks for your kind words, as well as your financial support. We love this stuff, but since it’s our only source of income (after quitting our “day jobs” to take the Whole9 full-time), we appreciate the “financial thanks” as well. Hope your Thanksgiving was enriching. I am fortunate enough to get my butter directly from the source…my sister raises goats and so I receive oodles of pastured goat butter from spring til late fall. Do you have any insight into goat vs. cow dairy products? I have heard that goat milk products are easier for humans to digest, but I’d love to hear your point of view on the subject. Good question. The difference (or claimed difference, anyway) between milk from goats vs milk from cows is in the protein fraction of the milk. There is some evidence that the form of casein from goat’s milk is less inflammatory/problematic than the bovine version. As long as the goats are 100% pastured and you take the time to clarify the butter to remove as many milk proteins as possible, you should be good to go. It would be a good idea to “rotate” the butter in and out of your diet, too, so in the “off season”, use other fat sources until spring when you start using the goat butter again. Hope this helps. If i can’t eat butter what can i put on my mashed sweet potato? its so delicious and i use tons of butter (organic cultured pastured grass fed raw) on them. Any alternative suggestions? Oh and Thanks for the great work, I’m excited about the book! For your Whole30, you’ll have to make do with cinnamon and nutmeg on your sweet potato – delicious, no? What about using Earth Balance Soy free vegan butter? Ryan – clarified butter is just as delicious, we promise. Ellen – that stuff is NOT butter. That’s a processed butter-like food product, and I could not in good conscience classify it as any sort of “good choice” based on the amount of vegetable oil it contains. Contrary to convention, the real deal is much healthier for you! awesome article — thanks for the read. i’ve been following a paleo’ish diet for awhile, and have come to love the taste of ghee / clarified butter. i used to stay away from it for “health conscious” reasons. It seems hard to take that point to mean anything other than clarified butter is OK during W30. Was this text maybe added or modified for the 10/12 publishing of the butter manifesto, so that the discussions in the comments has been superseded? We’re going to clarify this (pun intended) in the Monday Whole30 post, but yes… the one rule change we’re making to Version 5.0 is that clarified butter or ghee will be allowed during your Whole30 program going forward. Sorry if the comments are confusing – I could potentially edit those. YAY! BUTTER! WHOOP! WHOOP! I’m 10 days into my first Whole30, which is also my first experience with anything Paleo. It does help that I own a grassfed beef farm. However, I was just thinking today that I couldn’t possibly eat veggies sauteed in beef or bacon fat for one more day. Must go find some pastured, organic butter. Worth noting that us UK folks can order “Pukka” branded Ghee as it is organic and from pastured cows in Austria according to several stockists. He hasn’t reversed his opinion, per se, he’s just modified his recommendations based on his experience and the scientific information available today. We revised OUR recommendations several weeks ago as well, quite in line with what Robb is now suggesting. I love clarified butter and ghee…I’m on day 12 of my first whole 30 and have survived just fine without it BUT…it’s a nice option. wooooooooo! Lunch during my whole 30 is going to be awesome… veggies nuked with ghee and dill. Can’t find OV brand in the grocery stores near my house. However, they do carry Kerry Gold. What do you think of that brand? I am on Day 19 by the way! Kerry Gold is a solid option. Those Europeans are so far ahead (or behind, if you think about it) in terms of how they (generally) raise their animals. Good luck! I have to say I’m pretty stoked about this! I’m on day 20-something of my first Whole30 (it’ll be over on Wednesday this coming week) and I’ve lived just fine without butter. I’m just not a coconut oil lover. It’s good in some things, but I just don’t dig it with stuff like eggs and certain veggies (asparagus and coconut?? Ick.) I know some people love it to pieces…I’m just not one of them. :) For those of us with older Whole30 versions, will there be updates somewhere so we don’t have to buy the new success guide? Sad to say I have had mine for a LONG while, started the Whole30, quit, then started again 20-something days ago (success!!!). I do want to say a huge thanks, though. I feel FAB and have lost quite a bit of bulk (clothes fitting better…or even loosely!). I am a believer in clean eating now and don’t plan to go back, even after my Whole30 is done! We will not be issuing a Success Guide update to those who have an “old” version, nor do you have to purchase a new Success Guide. The ONLY change to the program is the inclusion of clarified butter or ghee, so just add that one food to your shopping list and you’re good to go. David – hilarious! Why would you go through the trouble to clarify the stuff if you’re going to use the less-than-healthy parts elsewhere? Thanks for the info! I am a massive lover of Kerrygold so very pleased to see you approve! What is the best way to clarify butter? There is a video right in the post above that demonstrates the entire process. In the post it says, “We do have a set of criteria that makes butter a good food choice, even during your Whole30.” So that’s a yes. Enjoy! any suggestions for making bulletproof/upgraded coffee without butter? it doesn’t come out very frothy with ghee or coconut oil, kind of just sits on the top. I am wondering if there is some way to add grass fed ghee and something else to make it frothy without the milk proteins of regular butter. Eric: I found that this works for some people: If you place a can of coconut cream in the fridge for a few hours, it should separate into heavy coconut cream and water. You can then use the concentrated coconut “cream” for coffee. I have a raging casein intolerance – as in, it takes about 1g of butter or less to have me in agony for a couple of days. Not that I test this very often, or on purpose. I’m a bit cautious, therefore, with respect to clarified butter and ghee. Exactly how much residual casein is there in these products? I really miss the taste of butterfat, but I don’t really have a few days spare to check if it’s okay the hard way. I’m not sure that brand ships to the UK, but I’ll keep an eye out :) I’m usually okay with wine fined with casein. And whatever I buy, I’ll make sure to quiz the company first! Hi! I Am just lost when it comes to the hormone content of ghee or clarified butter. I am following the Paleo lifestyle mainly because I want to get rid of acne, and dairy is just a disgrace when it comes to it, because of the natural hormone content of every kind of dairy. I fon’t know if by clarifying butter We’re getting rid of those hormones or if they stay in the fat. Very important matter for us acne-sufferers, any thoughts? We recommend purchasing pastured, organic butter and ghee, from cows not treated with additional hormones. Pure Indian Foods ghee (http://pureindianfoods.com) meets this criteria. 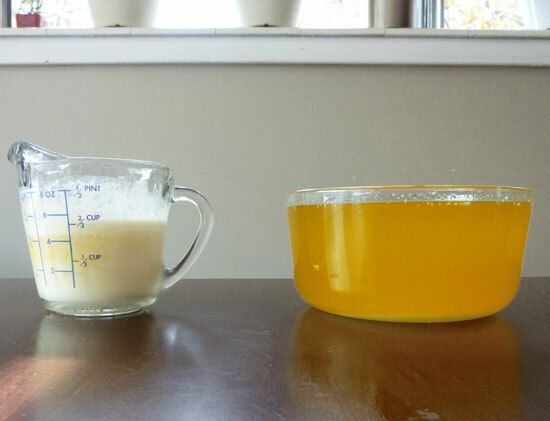 As almost all of the milk proteins are filtered out in the clarification process, this makes clarified butter or ghee a safe choice, even for those sensitive to dairy. However, if you’re wondering whether these milkfat products are affecting your acne, complete an elimination program like the Whole30, then reintroduce these products and see whether it affects your skin condition. Hi, I’m starting my Whole30 today and I have a practical question about clarifying butter. The instructions say to keep the clarified product in the fridge. What if you want to leave some out at room temperature, though, like you do with regular butter – so it’s spreadable/scoopable for everyday use? Is this okay? Thanks.